In the last tutorial we learned how to load and render png files with alpha layers. This time we’re gonna dive into rotating textures. Or more precisely ; rendering them rotated. Until now, we have been rendering using SDL_RencerCopy. But in order to rotate, we need a different function ; int SDL_RenderCopyEx it takes a couple more arguments. I’ll try to explain all of them. 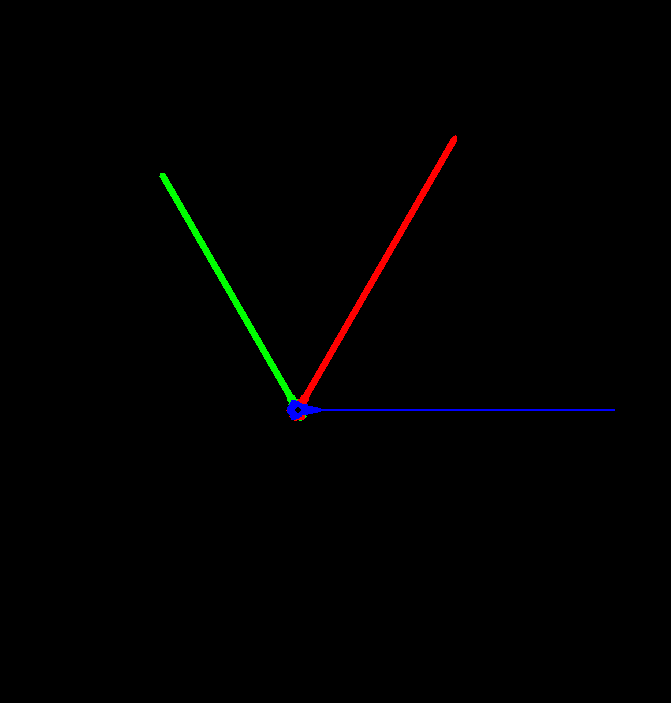 srcrect – which part of the SDL_Texture to render. null for everything. As you can see, the first four parameters are identical to SDL_RenderCopy you can read more about them in part 6. For now, we will just be using SDL_FLIP_NONE. The center of rotation is given as a position seen from the top-left of the texture ( remember; in SDL 0,0 is the top-left of a texture. ) If the center of rotation is 0,0 you rotate it from the top-left corner. The type of center is one we haven’t used before, SDL_Point. But an SDL_Point is simply just a struct with an x and y value. Here is a picture of on our clock hands. The white hole in the middle is where we want the center of rotation to be. All three hands look very similar to this, all hands have a hole in the base, and all of them rotate around that point. If you look closely at the green dots, you’ll see that the distance to the hole from either of the sides and the bottom is all the same ( three green dots. ) The green dots span the entire width of the base. So to find the center x value, we simply take half of the width. Looking at the picture, you’ll see that the distance from the bottom to the hole is the same as the distance from the sides subtract half of the width to find the y position of the hole. // Center.y is half of the width above texture bottom. The SDL_RenderCopyEx function can be very useful and is a very simple way of rotating textures. An by wrapping the SDL_Texture in a separate struct we can make the remaining code smaller and simpler while still keeping all the functionality we need. The full code can be downloaded here. Perhaps you want to include a note in your code for Visual Studio users, when dealing with time. Basically the compiler will complain about the “localtime(&timeEpoch);”, it’s deprecated, unsafe, the world will end today, bla, bla. with no further changes in the code. I’m following your tutorials, slowly, understanding SDL2 functions and the underlying structure in your code, just to grab a general idea. I’m using VS2013 and not a 1900×1200 screen resolution (smaller) so I need to modify the code sometimes to adjust it. So surely you can expect more comments from me, only when I think they are relevants. I’ll try changing it to fix the issue next time I’m on Windows. I don’t think it’s too important if the compilation still succeeds, since I’m using the std chrono library in later posts. Feel free to post as many as you like, I’m always looking to improve my posts. Don’t we have to include SDL within Texture.h, as it uses a lot of the SDL functions? My solution would not compile without me doing that. Thanks! Oh nevermind, my bad. It *does* compile, because it is being included *after* SDL is already compiled in main.cpp.